Often times, when a game is educational, it isn’t much fun. 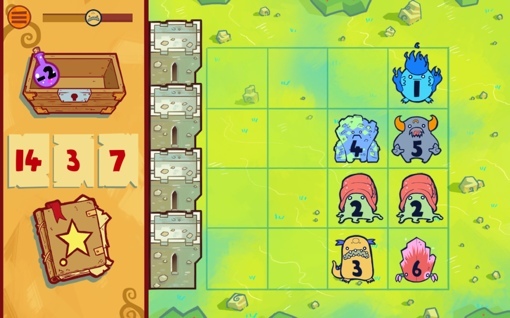 But a new tower defense type game called The Counting Kingdom breaks that stereotype: It’s a math learning game that’s actually a lot of fun to play. Designed for kids aged 6 through 8, the object of The Counting Kingdom is to defeat the numbered monsters on the right side of the screen before they can destroy the four towers you get at the start of each level. This is accomplished through creating balanced equations, adding monsters together to equal one of three numbers given on the left. One-time use potions are also available for use to help you change numerical values, reposition monsters or freeze them in place. Completing the first few stages requires little more than basic arithmetic skills. But as the game progresses, getting the highest score requires the use of advance planning and problem-solving skills. In that way, the game plays more like a fun puzzle than a learning experience. The Counting Kingdom is currently available for download for both PC and Mac via Steam at an introductory price of $8.99. The game is slated to arrive on iOS and Android soon.